GooglePlus, Google’s often maligned social platform, has just turned two. If you’re not using it, you’re making a big mistake. And you’re missing out on some truly incredible tools. Brands and social media marketers need to pay attention to GooglePlus now and start developing a strategy that puts Google+ at its center. And, hold on to your hat, because that strategy will need to be significantly different than your Facebook strategy. The bottom line: Google has made you an offer you can’t refuse. If you ignore Google+, then Google search will ignore you. You’d be crazy to let that happen. Could your brand benefit from better search engine rankings in Google? 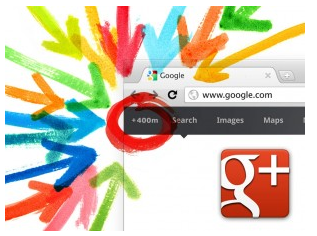 Yes, Google made mistakes at the beginning and yes, GooglePlus is a bit complicated to set up – if you do it properly. Remember, it was developed by engineers. It may take a little while to figure out Google+, but it’ll be worth every minute you spend. If you’d like to get started with an effective GooglePlus strategy, please contact me – 917-566-5855. I can help you. Google+ is now the second largest social network – right behind Facebook (693 million users) and gaining – with 500 million members, 359 million of whom are active monthly, a 27% increase in the past three months. 1-	Google Plus Hangouts on Air – a remarkable – no cost – video chat that an unlimited number of people can join. The feature is unique to GooglePlus and it quite simply antiquates platforms like GoToMeeting. No downloads are needed. You can start a Hangout from your gMail account or your GooglePlus page. 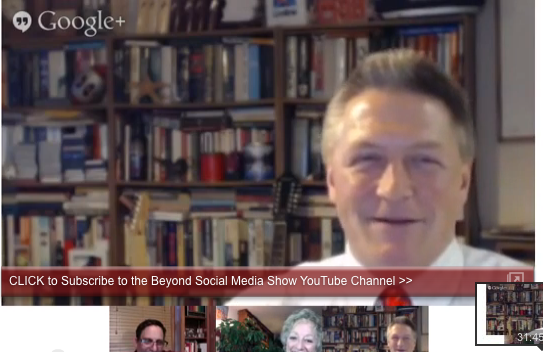 You can broadcast your Hangout in real time and save it to your YouTube channel. All free. My colleagues, Albert Maruggi and Dave Erickson, do a half-hour weekly Hangout on Air for ou Beyond Social Media Show. We broadcast live from our respective living rooms in three different cities. Hangouts on Air place an amazing array of tools at your fingertips. With the click of a mouse, you can hold a chat with 10,000 of your closest friends (just like President Obama or NASA), share slides and collaborate on documents with colleagues and clients, broadcast a performance or a concert, conduct on the street interviews, or set up a weekly talk show that you broadcast globally from your living room. 2-	Circles – Google+ circles make sharing content fast, easy and precise. According to Searchmetrics sharing on Google+ is poised to surpass sharing on Facebook by 2016. 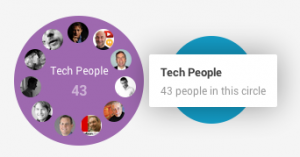 When you add contacts to circles, you can assign them to a particular group such as family, co-workers, friends, etc. Then you can easily select which of your followers will see your Google+ updates. If you want to share something with your bridge club, you choose that circle and only those contacts see the post. When you make updates “Public”, by not choosing to share them with a particular circle, everyone who has you in their circles can see them. Google+ users also can share circle with each other, and you can choose to follow circles that other Plusers have created. This is a great way to tap into a circle of experts and join the conversation. And, when a Google+ user “Circles” (follows) you, they are also giving you permission to send them email, making the platform an even more valuable marketing tool. 3-	Communities There are two types of GooglePlus Communities, public and private. The Communities feature allows groups to form around particular interests. From brands to boating enthusiasts, authors to astronauts, Communities creates a virtual meeting place for like-minded people with shared interests. You can even join communities as a brand – which you can’t do on Facebook – so you can interact with influencers, experts, current and potential customers. Right now, and surely not for much longer, there are no ads on GooglePlus. The time is now! The first step is creating a content strategy that is unique to Google Plus. Then create your profile and get busy, or you’ll soon be invisible.